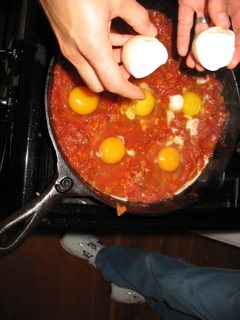 Posted on April 27, 2010 | by cookwithwhatyouhave | 5 Comments on Eggs Poached in Tomato Sauce, Organic Ag, Raj Patel, etc. Asparagus has arrived at the farmers’ markets here in Portland. In an attempt to work Asparagus into my upcoming “One-dish Grains and Beans” class I promptly overdid it. 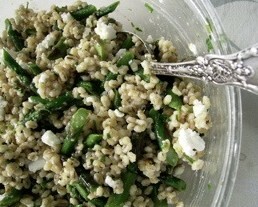 I made a warm salad of pearled barley, asparagus, feta, parsley and chives with a lemony vinaigrette. Judging from my husband’s face as he ate I knew instantly that this was not going to be taught in class next weekend. It was fine, acceptable dinner fare, but it prompted a conversation with him and then on facebook about when to keep things simple. I am usually a big fan of simplicity and I think asparagus shines, with some exceptions, in simple preparations. So class will feature an asparagus risotto (which I consider one of the exceptions). I clipped an asparagus recipe from the Oregonian’s FoodDay section years ago for braising asparagus with rosemary and bay leaves. I never would have thought to flavor asparagus with these herbs but it’s extraordinary and it falls squarely in the simple category. 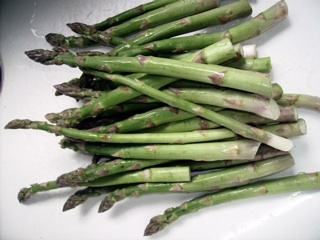 This is what I’m going to make with my second bunch of asparagus tonight. Note: I have neither a rosemary bush nor a bay tree in my yard but both exist in great splendor on my block and both of these plants produce way more than a dozen families could consume. So, look around your neighborhood if you don’t have your own and see what you can find. And you’ll meet some new people in the process . . .
Rinse the asparagus and break off the tough ends. In a skillet large enough to hold the asparagus in a single layer, combine the oil, asparagus, salt, rosemary sprigs and bay leaves. Sprinkle with several tablespoons of cold water. Cover. Cook over high heat just until oil and and water mixture begins to sizzle. Reduce the heat to medium and braise the asparagus, turning from time to time, just until the asparagus begins to brown in spots, 8-10 minutes (depending on the thickness of the asparagus). Serve immediately. And speaking of the Oregonian, there’s an interesting article in FoodDay today about radical homemakers with profiles of some local folks. However radical (or not) you might be, the idea of cooking more at home and spending time with your family growing, procuring and making food, can be an awfully fun and certainly delicious way to spend time. P.S. There is one spot left in my One-Dish Grains and Beans class on Sunday, April 25 so sign up if you’d like! And I promise there won’t be an barley with asparagus. I will never forget the meals that were delivered to our doorstep more than three years ago when our son was born. Miraculously they just kept arriving. I remember many of these meals in great detail and the joy of eating them. I particularly remember the giant box my friend Ellen brought. She had made not one, but two meals. There were warm cookies and a bouquet of daffodils. I thought I had died and gone to heaven. 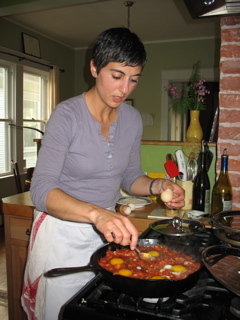 As you know I cook–I am a fast cook, I like to cook, I’m not daunted by cooking. However, as everyone told me, I was completely unfit and unable to cook right after Ellis was born. I don’t think I really cooked for the first six weeks. It seems so hard to imagine now but babies, and particularly first babies I imagine, are all-consuming, especially for the mother who usually is nursing what seems like all the time. I remember a day when a banana peel sat on the counter all day because I never managed to get it into the compost bucket! One of my dearest friends just had a baby and today is my day to cook for her and her family. I’m not sure I’m going to muster two meals but a hearty one it will be. 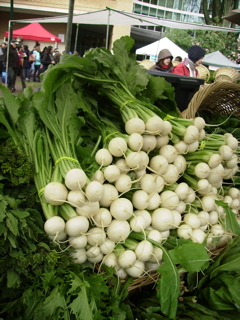 I just made the Turnip and Turnip Greens Soup putting to use those sweet, tender, and bright white turnips that are gracing our markets at the moment. The greens are fresh and wonderful to incorporate in this soup. It is spring in a bowl! I add a few squeezes of lemon juice and a couple of tablespoons of heavy cream at the end. And I use my homemade Veggie Bouillon instead of chicken stock, but otherwise I follow this recipe from Culinate.com closely. 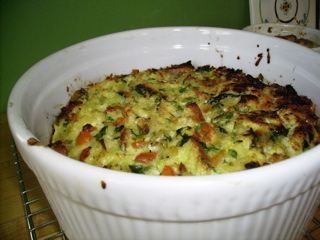 I am also just made a savory bread pudding with lots of herbs, carrots, onions, chard, and extra sharp cheddar. It’s good warm or room temperature. It keeps well and will be a rich and hearty accompaniment to the soup. So maybe it will turn into two meals after all. And since I prefer meals with dessert and nursing mommies need all the calories they can get, there will also be a quick jam tart that I read about on one of my favorite blogs, Smitten Kitchen, this morning. I had intended to work today–as in plan class menus, review my marketing plan, organize finance stuff, edit my website–however, since I’ve chosen cooking as my line of work, I think I AM working today. And I can’t think of anything I’d rather be doing. 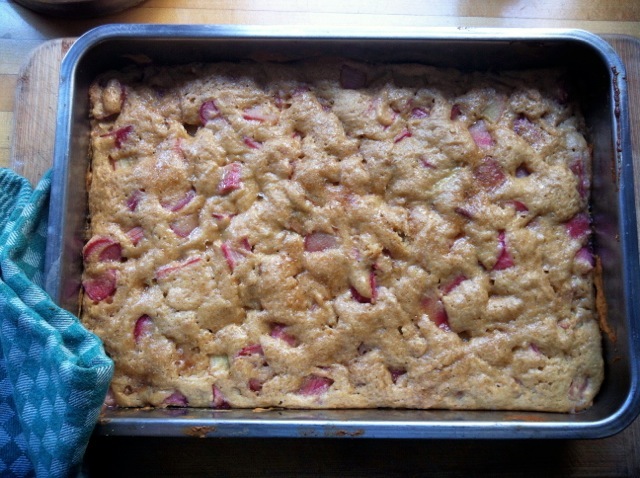 I make this cake every spring when rhubarb starts showing up in the farmers’ markets and now also in my very own garden. This cake is not very sweet so if you like sweeter desserts I would add a few tablespoons of honey or maple syrup in additional to the brown sugar. Cream butter with a wooden spoon, add zest and sugar and cream together until well blended. 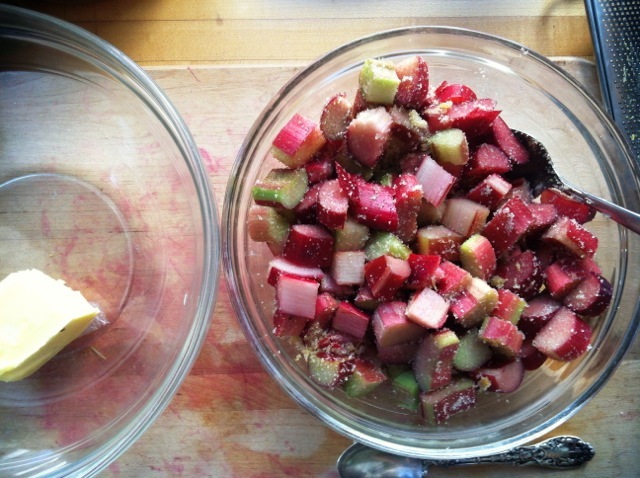 Whisk in egg and vanilla, add flour, soda and salt and finally yogurt and then rhubarb until mixed. Do not over mix. Spread batter in prepared in pan and bake until golden around the edges and tester comes out clean about 25 minutes. It will seem a bit soft but firms up as it cools. Serve as is or with lightly sweetened whipped cream if you’d like. I was born on Mother’s Day. I joke with my mother that I don’t need to give her a gift as long as I’m still around. And my mother always says, “All I want is a hug and maybe a piece of chocolate cake.” I added the latter – she doesn’t actually say that but I think that’s what she would love to have, in addition to that hug. 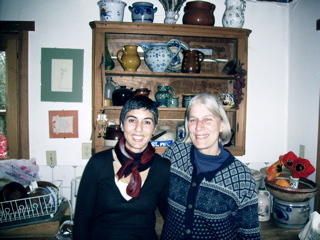 As you might recall from previous posts, my mother is also my biggest culinary influence. She is the original “cook with what you have” cook. And she does it with style and for a dozen people on the fly practically weekly. She also lives 13 miles from the nearest grocery store. And she has the most bottomless and varied of all chest freezers (all home-grown too)– far better than most stores! I don’t know about you, but it’s not always easy cooking with other people and in other people’s kitchens. And my mother, who is a very fast and efficient cook, does not always love sharing her kitchen with others. But whenever I’m at her house I inevitably cook and we have such a seamless rhythm together in the kitchen and she never fails to note how much she loves to have me in the kitchen. I’m sure it’s that we’ve worked side-by-side in kitchens for 30 + years but it still seems noteworthy that it’s such fun. We do have our culinary disagreements, particularly about what constitutes properly cooked meat and fish. She’s more of well-done type! And she doesn’t quite see the point of stocking two different kinds of olive oil: one for finishing dishes, salad dressings, etc. and one for sauteeing and such. But beyond that, we’re pretty similar. We just cooked Easter dinner together and I have to admit, even though the leg of lamb was more done that I would have chosen, it was very good. So I think we should celebrate mothers and daughters for the whole month of May this year and I’ve scheduled a class on Sunday, May 16th for you mothers and daughters who would like to spend a few hours in my kitchen with each other and cook together. And if you’d like a private class with another mother/daughter pair or two either in my kitchen or yours we’ll schedule something! And speaking of spring and Easter and Mother’s Day. 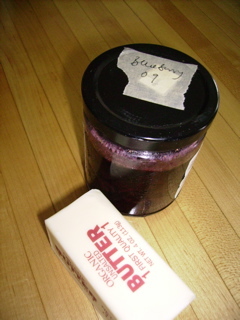 … home-made mayonnaise season has started in my house! It is actually never really not in season, it’s just that now that my chives, oregano and parsley are prolific in the garden I love it even more. We had fried razor clams the night before Easter and dipped them in herbed mayo; last week we ate it with sweet potato fries (made with lime juice and cilantro), and this week it will go in the egg salad (using up all those easter eggs). Whisk egg yolks with lemon juice and salt and pepper. Then very, very gradually start pouring in the oil in a very thin stream, whisking as you go. After you’ve incorporated about 1/4 cup of oil you can start speeding things up a bit. Continue until you have a consistency you like. It will get thicker and stiffer the more oil you add. Add chopped herbs at the end and add more salt and/or lemon juice if it needs more tang. To make the classic French garlicky mayonnaise (aioli), mash as many cloves of garlic as you want (you can start with as few as two and go up to about 10 for a very spicy, strong aioli) with some coarse salt with the side of a chef’s knife (or in a mortar) until you have a fairly smooth paste. Add the garlic paste to the egg yolks, lemon juice and salt and proceed as with the mayo above. 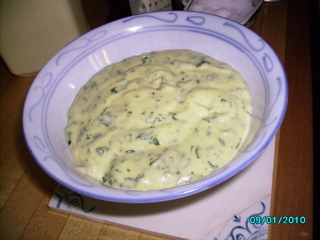 Typically aioli does not have fresh herbs in it but sometimes I add some chives or parsley or basil. And traditionally you would use olive oil for this but I find that it often gets too bitter and strong if you use 100% olive oil so I suggest you use half very good-tasting extra virgin olive oil and half sunflower or some other more neutral oil.